Users site level status decides whether the user will be able to login into the site (Active) or not (Blocked). Regardless of any classroom level status, if users are blocked at site level, then they will not be able to login to Teamie and access any classroom(s) that they are part of. Active status: User will be able to login to the platform and access any classroom(s) in which they have an Active group status. Blocked status: User will not be able to login to the platform and therefore won't be able to access any classroom(s) that they are part of, if any. 2. As an admin, you can easily view which users are active or blocked at site level from the Manage People page. The site level status for a user is shown under the Site Status column. 3. 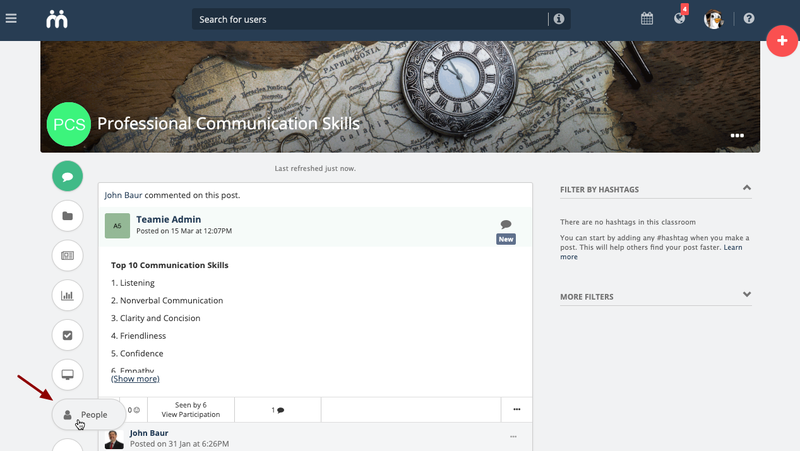 Users' status on site level can also be seen from their Profile page. In case a user is blocked at the site level then a Blocked label will be shown on the user's cover image, otherwise they will have an Active status on the site level. See Updating users' site level status to learn how to update the users' site level status. 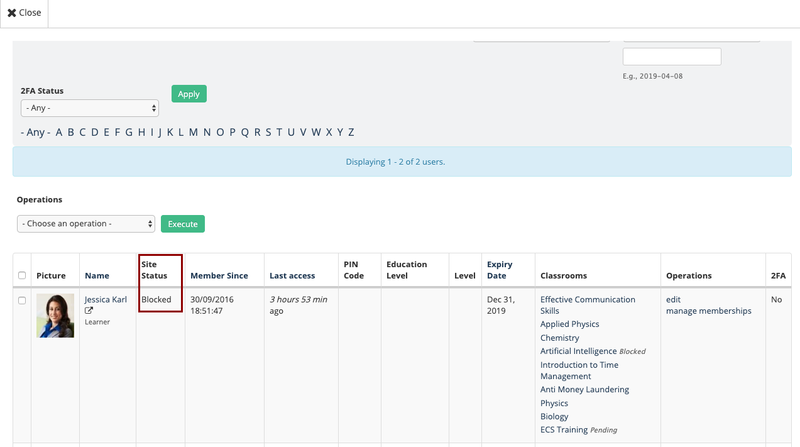 At classroom level, users can be either Active or Inactive (blocked/pending). Users are considered active in a classroom if they are active at both the site-level and the group-level. Only the users that are Active will have access to the classroom while user with all other statuses (Pending/Blocked) will be considered as inactive and will not have access to the classroom. 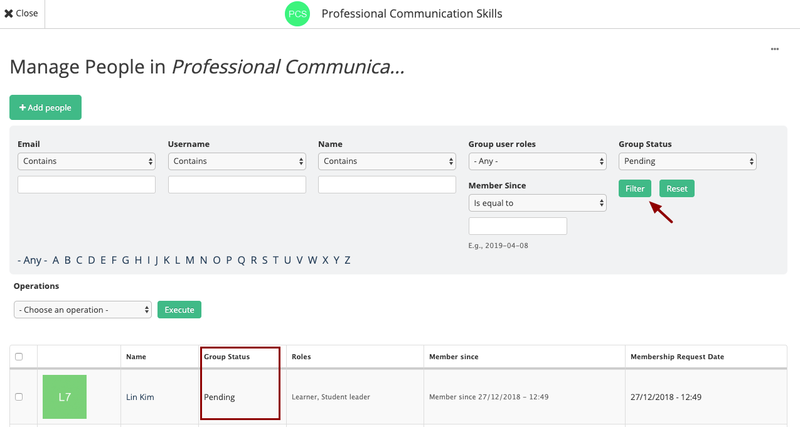 The inactive users status can be verified further with the help of Group Status from the Manage People page of a classroom. 1. 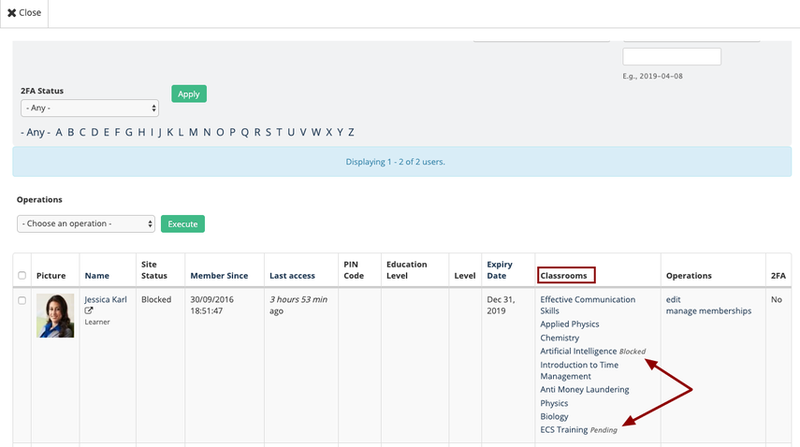 Active/Inactive status for users in a classroom can be accessed from the People page of a classroom. By default, all the active users will be listed on the People page of a classroom. 2. 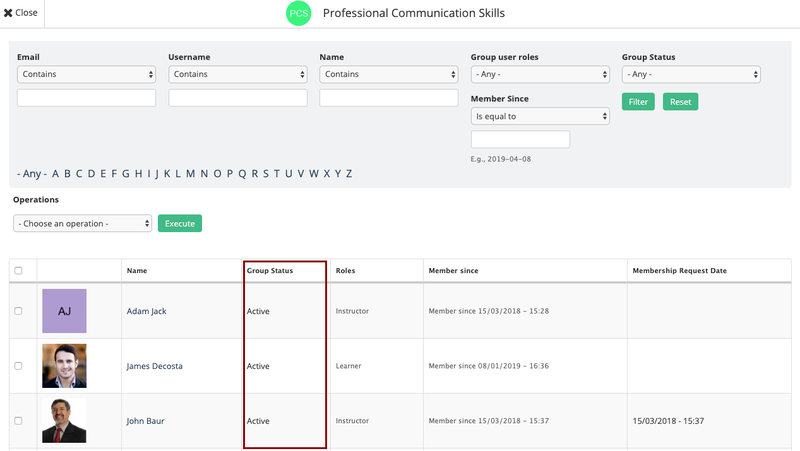 You can filter the users on the basis of their active/inactive status by clicking Active/Inactive and then selecting the required status from the resulting drop-down. 3. Active status is assigned to classroom users when they are active at both the classroom level and the site level. 4. Inactive status is assigned to users when they are Blocked at site level, and / or Blocked or Pending at classroom level. 5. 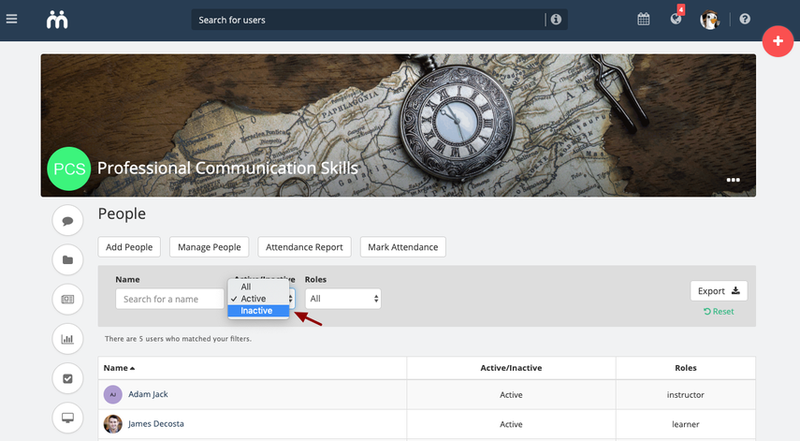 As an admin/instructor, you can check whether a user is in Blocked or Pending state by clicking the Manage People link. Pending: Users whose approval request is pending for classrooms (with approval required). These users will not have access to any resources and posts of the classroom. Blocked: Users who are blocked from a classroom. These users will not have access to the classroom in which they are blocked. By default, all the active users will be listed on the Manage People page of a classroom. Users blocked at classroom level in one of their classroom will still have access to all other classrooms that they are part of and are Active in. 6. 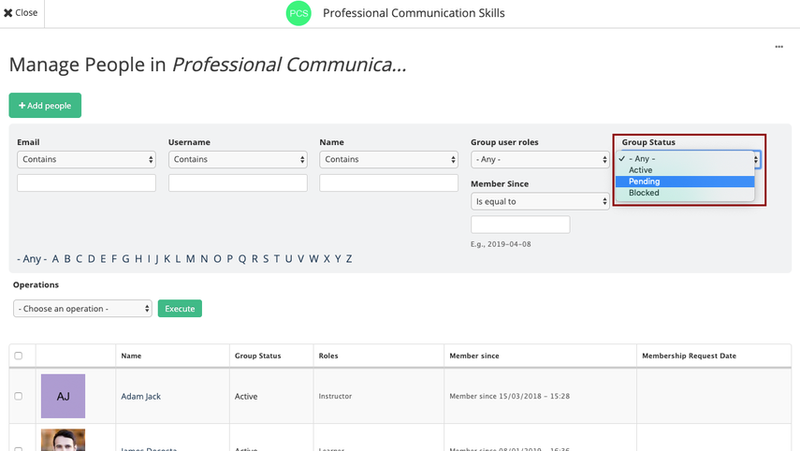 You can filter the users on the basis of their group status by clicking Group Status, selecting the required status from the resulting drop-down and then clicking Filter. 7. 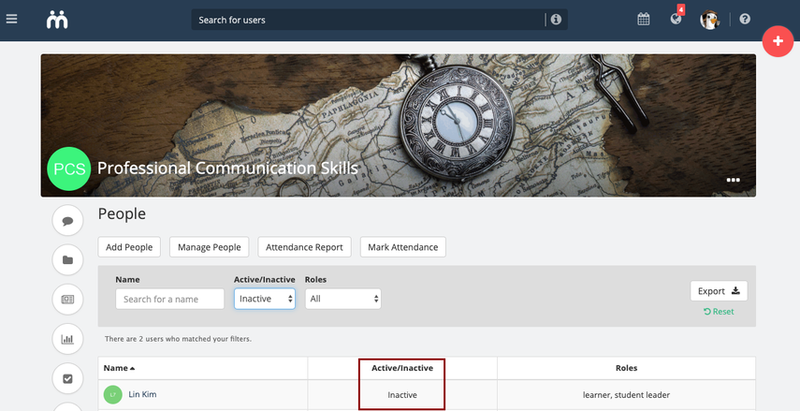 As an admin, you can view which users are inactive (blocked/pending) at classroom level from the Manage People page. The users who are blocked/pending at group level will have a Blocked/Pending label in front of their respective classroom names under the Classrooms column. 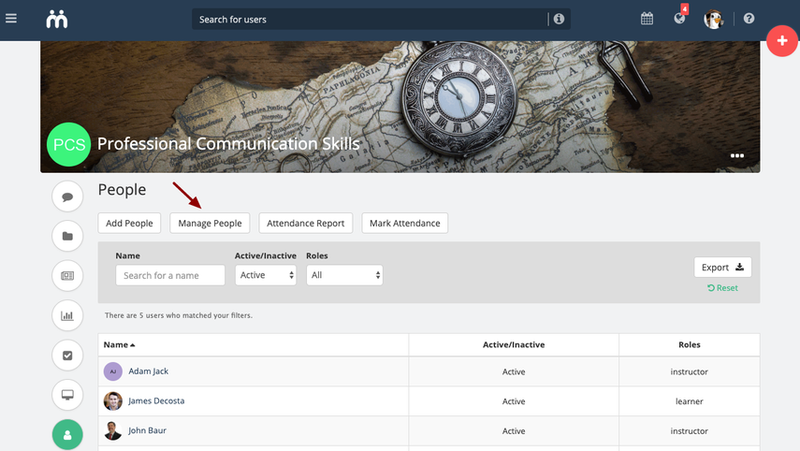 See Updating Users' Group (Classroom) Level Status to learn how to update the users' group level status.